iHeartRadio Canada is set to bring its FanFest event back to Toronto for a second straight year, and organizers have revealed the star-studded lineup for the event's 2018 edition. 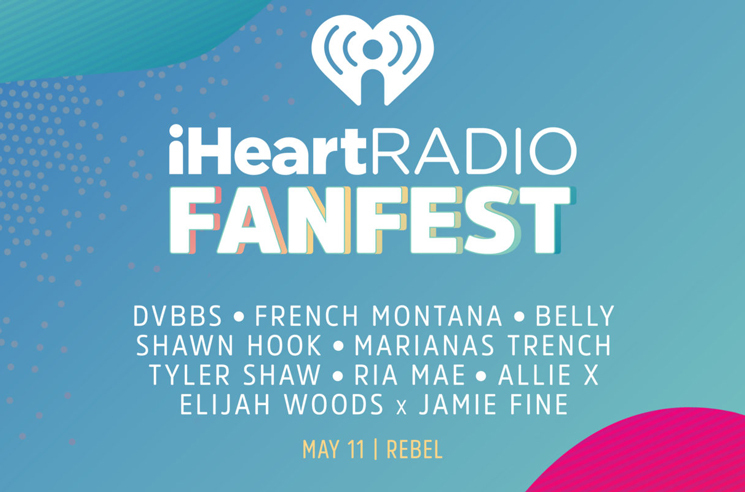 In conjunction with Canadian Music Week, the event will bring DVBBS, French Montana, Belly, Shawn Hook, Marianas Trench, Tyler Shaw, Ria Mae, Allie X, and Elijah Woods x Jamie Fine to Rebel on May 11. "We are excited to bring this incredible lineup together for an unforgettable night of music," head of radio content, strategy and iHeartRadio Rob Farina Head said in a statement "At iHeartRadio we're committed to connecting fans with the music they love, and we can't wait to celebrate CMW with them at iHeartRadio FanFest." Tickets for the 2018 iHeartRadio FanFest go on sale Friday (March 23) at 10 a.m. EDT at Ticketmaster. A presale begins tomorrow (March 21) and closes March 22 at 10 p.m. EDT, with fans able to win their way in through listening to iHeartRadio stations across southwestern Ontario for presale codes. The news of the festival comes as iHeartRadio's parent company iHeartMedia Inc. filed for bankruptcy earlier this month.